Living nativity scenes From 01/12/19 to 06/01/20. As the Christmas festivities draw near, many homes display nativity scenes. 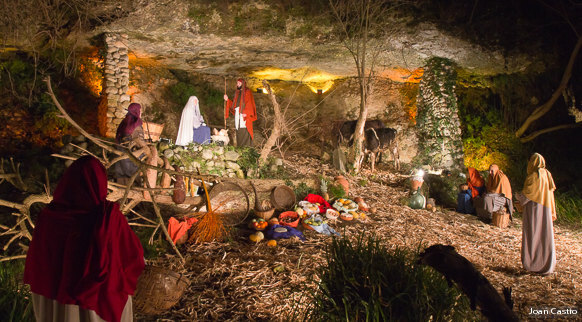 The scene of Christ's birth is recreated using tinfoil for streams, moss for greenery and all the traditional figurines, with the new-born baby Jesus in the centre, accompanied by Mary, Joseph, the Three Kings and others. In many towns in the Girona area, nativity scenes can also be found outside. In living nativity scenes actors perform scenes from the Christmas story in various locations of the town in question. All the costumes and accessories are planned down to the last detail to immerse us in these historical and biblical scenes faithful to the local customs of the time. If you're keen to follow this fascinating Christmas route, there's a long list of towns on the Costa Brava and in the Girona Pyrenees where the tradition is kept alive from generation to generation: Amer, Castell d’Aro, Bàscara, Fontcoberta, Brunyola, Joanetes, Santa Pau, Pals, Avinyonet de Puigventós, Bescanó, Flaçà, Llers, Peralada, Puigcerdà, Riudaura, Santa Cristina d’Aro, Celrà, Tossa de Mar, Vilavenut and Navata.